” Ah Zulu? I think the expression is ‘lying through your teeth’?” Oh really? Who’s blog is this? Well, that may be the original expression, but I’ve changed it; why not? ” I never gave them Hell. I only told them the truth, and they thought it was Hell.” Harry “Give ’em Hell Harry” Truman. This is not a political blog post today! There are several different kinds of liars; let’s cover a few. donald trump (small letters). A bonafide, pathological, malicious liar on an unprecedented scale. Sarah Huckabee Sanders- Liar. Lies for a living to cover up for Liar Number 1 above. Hope Hicks- Liar. Claims to tell “little white lies” for Liar Number 1 above. (Seeing a pattern?). Zulu Delta-Liar. Mindless-Unhinged- Midnight Blogger who fabricates harmless truths to see if anyone is actually paying attention to this world while also protecting his digital identity! Woooooooo! This should be fun! Let’s get into it! Here is the standard disclaimer. As a rule, I avoid lying in the “real world” on important matters. As evidence has shown, it’s far easier, to tell the truth; you never have to keep track of your lies, and although people’s feelings may still get hurt, it is an honest recourse. Of course, tact and discretion are always advisable in these matters. I hate filling out forms; despise it actually. A personal combination of ADD, MYOB, and K.M.A you S.O.B! When I joined and completed my time in the U.S Navy, I filled out enough forms, and wasted enough paper to kill 20 forests (there I go lying again!) At that time and since then, I am thoroughly convinced that most of the information is useless, and more importantly, nobody is reading it anyway. I test this theory on a regular basis. Starting with the medical community (except for all my readers in “said” community). 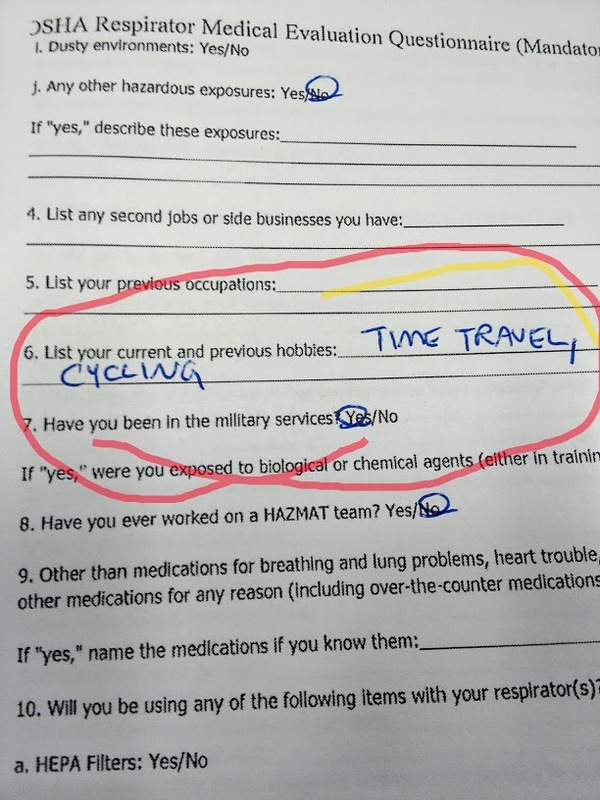 I arrive at an eye exam 15 minutes early and wait 1 hour until I am “seen.” With only my thoughts to cave in on me while I “steam” about the delay, I begin to add additional comments on my medical questionnaire. “Do you have any specific questions/concerns you would like to discuss with the doctor today?” Why yes I write; I would be extremely interested in the “Clark Kent/ Superman X-Ray Vision Upgrade!” I turn in the form; NOTHING happens. Nothing is said. No smile, giggle, no frown, no annoyance, no interest. Wasted ink. At least I have the laughter in my own head, not to mention this story. For 20 years I have been filling out the OSHA Respiratory Questionnaire at work. The very first question is always “Can you read?” In recent years, I have been checking NO. I have yet to be asked about it. As you can see from the picture above, I have also begun to list “Time Travel” as a hobby. Nothing….blah, blah, blah. Rinse and repeat. Yes, it’s possible that “someone” is just doing their job and doesn’t appreciate my humor or wisecracks, but I don’t even think they see them. In the modern internet era, we are constantly being asked to provide personal information from sites such as the IRS and Credit Cards to social media, and the comment section of the local newspaper. I usually only provide enough facts to obtain the information I want or get the results I need. This is also why I either make up an alias or incorrectly fill out the boxes with fictitious information. Sometimes years later, that false information comes back either as a letter or email addressee (calling Sir Dennis), and I know where they got it. This also helps to sort paper U.S Mail. If I see a letter in my mailbox addressed to Isa Green or Fat Burns, I know it’s junk mail, and it goes into the recycle bin without so much as a second glance; regardless of how many nickels or pennies, they glue to it. “We’re” often told, this information will not be sold, passed on, or used for any other purpose. That’s was just a lie. I forget who said: I’d lie if I could remember what I said. Bahahahaaaa, hilarious, time travel, can’t red, Clark Kent, I love it!!! 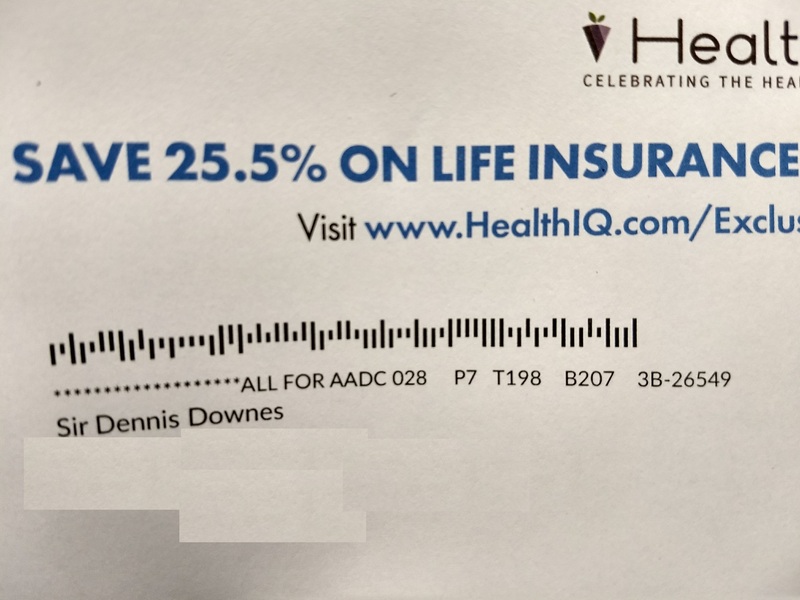 I once accidentally forgot to add one letter to my address, and as you are saying, it didn’t take long, and some junk mail arrived addressed to this slightly wrong address. So interesting to see that it was my phone provider back then that must have sold my private information. Suckers. The other day I was watching a bunch of documentaries of former CIA agents telling us what to look for in liars. Very interesting.